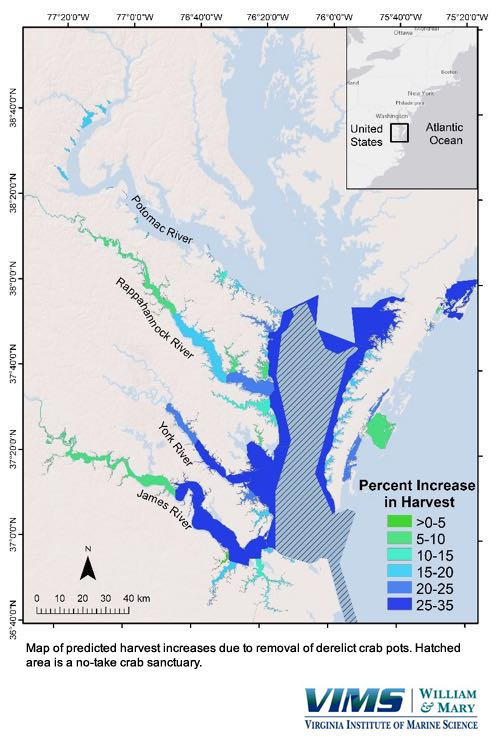 Economic effects of derelict pot removals Virginia blue crab harvest with (blue) and without (red) the Virginia Marine Debris Location and Removal Program. Bands are 95% confidence intervals. Graph courtesy D. Bilkovic. Costs & Benefits Average costs (squares) and benefits (circles) per pot removed. Average benefits equal estimated total revenue increase divided by derelict pots removed. Average costs equal total compensation paid for removals divided by derelict pots removed. Vertical dashed line denotes start of removals from targeted hotspot areas. Graph courtesy D. Bilkovic. 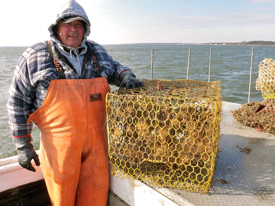 A new study by researchers at the Virginia Institute of Marine Science shows that a 6-year program to remove derelict crab pots from lower Chesapeake Bay generated more than $20 million in harvest value for area watermen. The study, co-authored by VIMS professors Donna Bilkovic and Kirk Havens, appears in today's issue of Scientific Reports, an online, open-access journal from the publishers of Nature. The research was supported by NOAA’ s Marine Debris Program. Recognizing that derelict gear is a problem that extends far beyond Chesapeake Bay, the researchers also applied their methodology to estimate the economic benefits of removing derelict crab pots and lobster traps on a global basis. This analysis showed that removal of even 10% of derelict pots and traps from major crustacean fisheries—the percentage of the Bay’s derelict pots they estimate were removed by the VIMS program—could increase landings by 293,929 metric tons, at a value of $831 million annually. The program to remove derelict crab pots from lower Chesapeake Bay was paid for through disaster-relief funds made available in 2008 when the US Department of Commerce declared the Bay’s blue crab industry a “commercial fishery failure” following many years of declining harvests. The researcher’s analysis shows that the program was a sound investment, with its $4.2 million price tag over 6 years easily recouped by the extra $21.3 million in blue crab revenues earned during that time. “The benefits far outweighed the program’s total cost,” says Scheld. 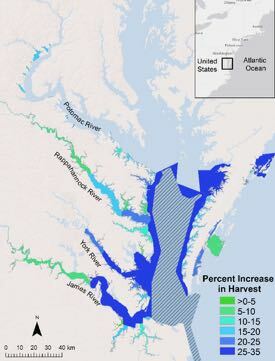 “We found that removing only 10% of the pots taken during the actual program, if those efforts were focused on the 10 most-fished sites, would have increased blue crab harvests by 8,144 metric tons, or about 60% of the benefit we saw from the full removal program,” says Scheld. Recognizing that removal funds are limited and that some pots will always be lost, the scientists recommend a combination of preventative and mitigating measures to most effectively deal with the dilemma of derelict gear. “Ensuring both that crab pots have biodegradable escape mechanisms and that removal efforts target areas of highest fishing pressure are likely to yield benefits superior to any single strategy alone,” says Scheld.